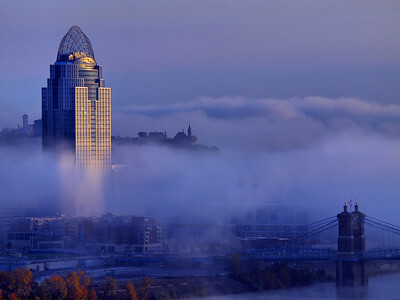 Photographs of Cincinnati, Ohio from above, below and all around. 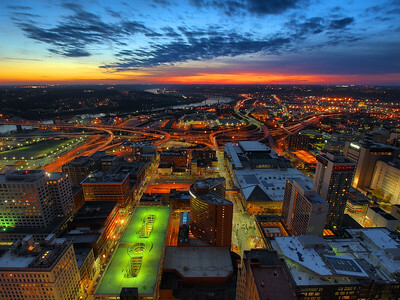 Sunset From atop the Carew Tower One of Cincinnati's best kept secrets is the Carew Tower 49th floor observation deck. 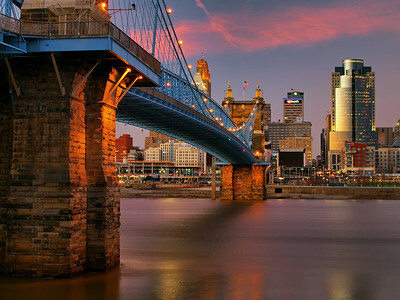 For two whole dollars you get a 360 degree view of downtown, Over-The-Rhine, Covington and Newport Kentucky, the West Side, East End and the list goes on and on. It is hands down the best view around. So yesterday after my lovely Lisa and I did a super cool photo shoot of local band Buffalo Wabs And The Price Hill Hustle in the old Decorsey Train Yard south of Latonia, Kentucky (and after much debate on if we should wait for better clouds) we headed over to the Carew Tower for sunset. When we reached the top and as we were setting up the sun was literally sinking below the horizon, after a few minutes it seemed like nothing was going to happen so I moved on to shooting some cityscapes. About 10 minutes had passed when Lisa said something to me and when I turned around to respond I realized there was a show going on behind me. "Oh my gosh!" And I ran over to the western side of the deck as the sky over Price Hill and Western Hills had turned aglow with a beautiful Red. I've said it once, and I'll say it again, never underestimate a sunset. Just when you think it's a dud, it will prove you wrong, and my friends I've been proven wrong on several occasions. 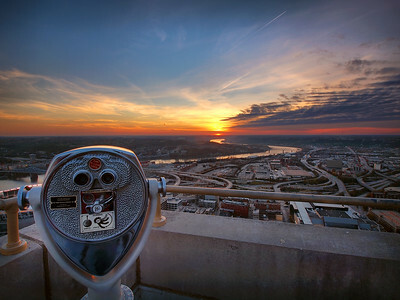 Sunset from atop the 49 story Carew Tower looking out over Northern Kentucky, the Ohio River and the Cincinnati west side. 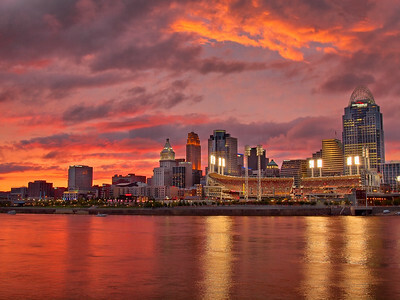 With the national spotlight being focused on Cincinnati this week as the Major League Baseball All-Star Game and Home Run Derby being played here tomorrow and tonight, respectfully, I thought I post a Cincinnati Skyline shot this week. 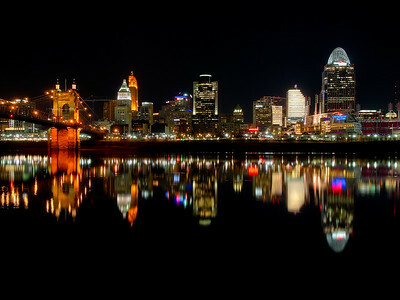 In my opinion Cincinnati has the prettiest skyline in the Midwest and the most photogenic. This past Thursday I got out to do some late evening shooting before heading out on the town to celebrate my birthday. We've had a lot of rain and cloudy days around here so sunsets have been few and far between, but I was hopeful that sunset would be a doosy. Well it was really weird and I wasn't able to get a good shot of it, however while I was shooting the skyline I noticed the gloomy clouds had turned an eerie purple. A tone that I'd never caught the skyline in before, turning out to be the start of a great night out! 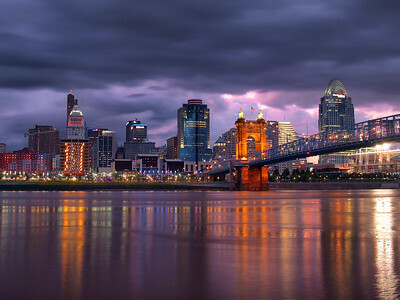 Roebling Suspension Bridge Cincinnati Skyline From Covington, Kentucky Last week a fellow photographer contacted me about purchasing a print and since we lived in the same city I thought a good place to meet would be on the Covington, Kentucky Waterfront so I could knock off two birds with one stone. One, I could give her the print. Two I could shoot the Cincinnati, Ohio skyline at sunset while I waited for her to arrive. As usual the skies completely cleared that day and on my way there I got pretty disgusted but as I got closer to the city I saw there was some thin clouds hanging over the skyline. When I arrived I realized I had miscalculated the angle where the sun set, it was actually to my back, but that would turn out to be a mute point for after few minutes the clouds above turned a beautiful pink and the city was ago with the last rays of the sun. 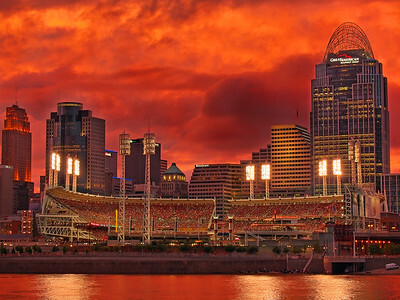 Sunset Riverfront Cincinnati, Ohio On this night I had a meetup with my photography club Misfits With Cameras to shoot the Cincinnati Reds postgame fireworks at General James Taylor Park in Newport, Kentucky. With the river up many of the fireworks had been submerged and did not go off and although the show was still awesome the real show was at sunset, one of the most spectacular I have ever witnessed! 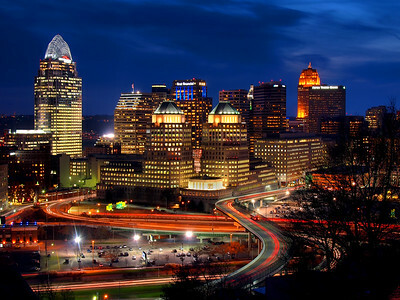 Cincinnati Skyline From Mt. Adams I can only take so long where I haven't done any shooting. On my way home from work the clouds began to break after several days of cloudy skies, when I arrived at home I had no intentions of going and shooting sunset, although the thought had crossed my mind. Turns out I forgot to pick up milk and cereal, so I thought I would make the best of it and drive over to Mt. Adams and shoot sunset over Cincinnati. As it would turn out the skies filled back up and sunset was pretty much a dud, but as I stood there and watched the gridlock on I-71 and I-471 I figured I might as well stick it out for a while, who knows what will happen. I ended up staying to near dark and just as blue hour gave way to night the light of the city against the blue of the sky created a scene that made the trip worth more than just cereal and milk. Sunset Downtown Cincinnnati Ohio Big storms came through yesterday as well as one of the coolest cloud formations I'd ever seen, too bad I didn't have my camera with me, but in knowing everything was going to move out by sundown I collected up my wonderful other half and we headed up to Mt. 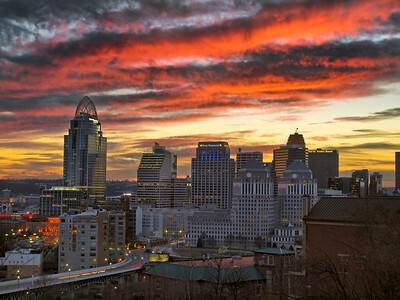 Adams to catch sunset over Cincinnati. My, what drama we had in store for us! Saturday afternoon when I stepped outside with the pup it was quite apparent there was some good cloud action going on. Go shoot sunset? Absolutely. So Lisa and I hopped into the car and headed up to Mt. 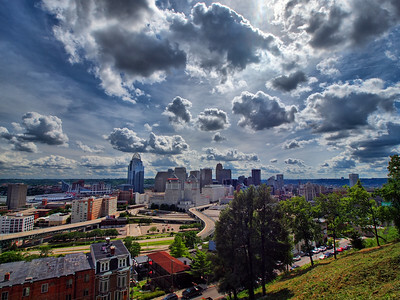 Adams, a hillside neighborhood that not only overlooks downtown Cincinnati but also nearly puts you right on top of it. Looking for somewhere new to shoot I decided to stop by a short dead end street that a couple years back I had shot the city skyline with my 68 Impala Convertible in the foreground. Even though it was 50 degrees the wind made it feel like it was 30, we were freezing. But as the sun set behind the city we were treated to gorgeous display of light on the clouds above the city and for a little while we forgot how cold we were. Late Afternoon From Mt. Adams Cincinnati, Ohio I don't know what the rest of you got to see but this past Saturday the skies during the day were absolutely stunning. It was like it was polarized, high definition clouds against a higher thin layer of clouds. We had a couple hours to kill before my birthday dinner at Eli's BBQ in the East End of Cincinnati so Lisa and I decided to hit a couple of the overlooks that were nearby. After stopping by Anderson Park in Columbia/Tusculum, where things turned out to be a bit dull, we headed over to Mt. Adams and to one of my favorite views of the city. I've almost exclusively shot here for sunsets and nighttime images and I even mentioned that to Lisa that it was the first time I'd ever shot here in the middle of the day. When we arrived it was just as I had hoped, the sun was just how I wanted it over the city and those hd clouds were just popping. I had no idea how the photos would turn out when I was shooting, I was definitely in some unfamiliar territory as I rarely shoot in direct sunlight. In fact I had little confidence they would turn out good at all. I'm glad I was wrong, because I really like this one. 4th Street/Great American Tower Downtown, Cincinnati, Ohio I love finding photos I forgot I took. 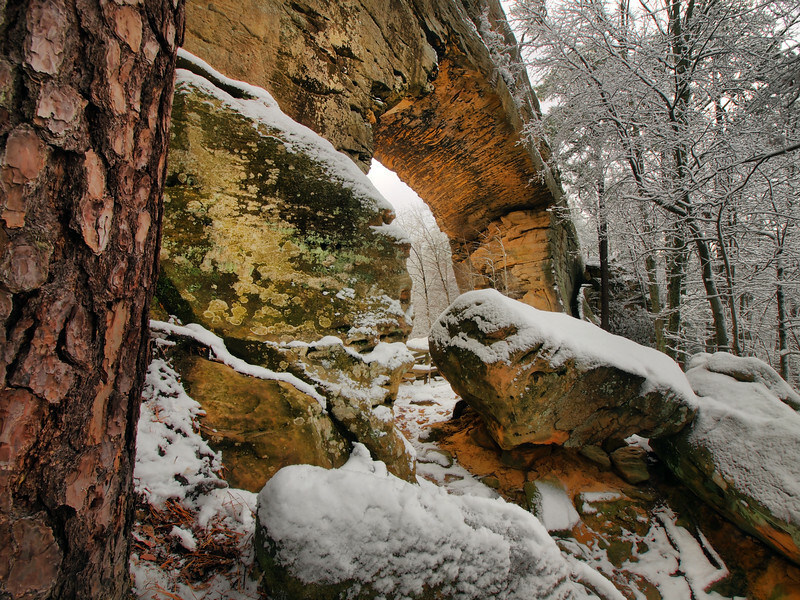 I couple Friday's ago we got our umpteenth snowstorm here in Northern Kentucky so my good friend Jason came over in his Jeep Grand Cherokee and picked up myself , my other half Lisa and a cooler of beer and out into the storm we went. For those of you who don't know one of my all time favorite pastimes is riding around in a vehicle, drinking beer (Jason didn't drink any)and taking photographs during a snowstorm. This here is my favorite from the evening and I was feeling pretty good about this time. 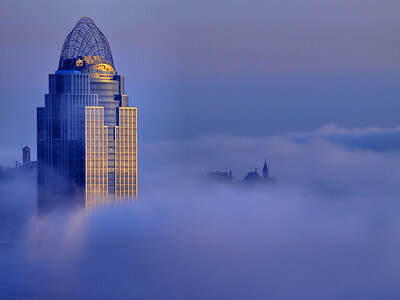 Sunrise Great American Tower Downtown Cincinnnati Ohio I decided to get up early and go have a peek at the Cincinnati skyline at sunrise hoping there was some fog around the city and to my delight there was. 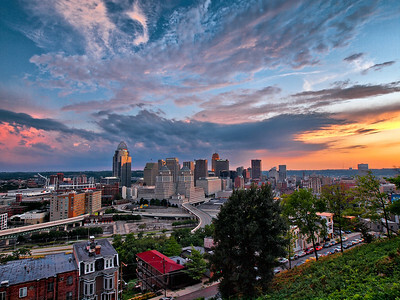 Shot from Devou Park in Covington, I've never been a real fan of this view of Cincy, and I can't really explain why. 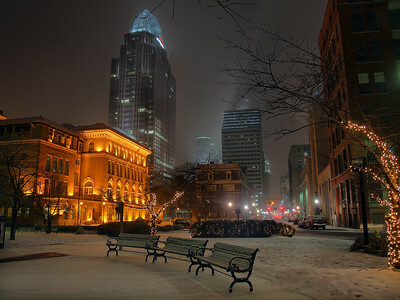 However one thing I do like about it is you can get some great isolations of the city. In actuality I like the view from Mt. Adams much more, which can be seen in the background poking through the fog and next time that's where I'm going to shoot a foggy morning from.